My friends hadn’t been to the Punggol Container Area before, and I had been wanting to visit D’Grill because some foodie friends recommended it to me. This meal occured 3 to 4 months ago but I just didn’t have the time to write a review about it. It’s a positive review. But before I review the food, I want to say this: I saw many customers bringing food from other shops to eat here. Ok, I know different family members may want to eat different things, but this is people’s business. By occupying the table and eating food from other shops, the inconsiderate people are preventing D’Grill from making money. In fact, because it’s packed, customers move on to other shops, so D’Grill is not only not making money, they are losing money; it’s a double loss for them. If family members want to eat different things, split up or just disciple the children into eating at one place. No wonder many children are entitled these days. I find the D’Grill people too nice, not telling the families off. 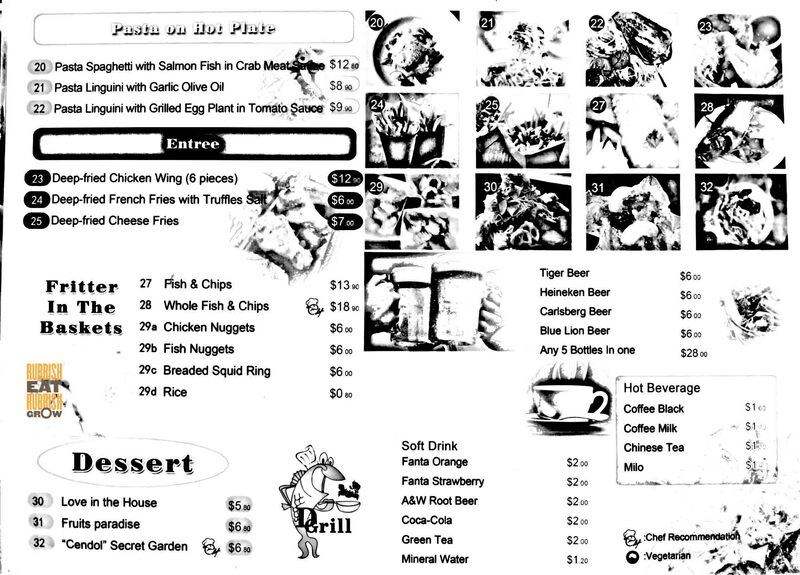 The menu here is a little schizophrenic: it’s western food and sambal hotplate seafood. Most of the western food dishes are deep-fried or grilled or pasta-based. 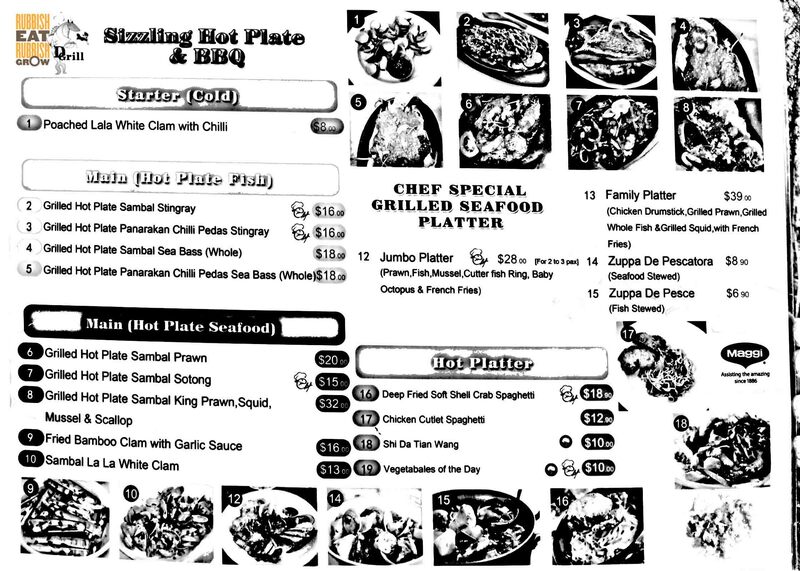 Most of the cze char food are sambal hotplates: sambal sotong ($15), sambal prawns ($20), sambal mix seafood ($32), sambal white clams ($13). You can tell they are very proud of their sambal. (I am going to guess it’s made in-house?) But on the flipside, because half of the dishes have sambal lathered on them, or the other half is deep-fried, the menu gives an impression of lack of variety. Maybe they need to rethink about their dishes. For me as a consumer, I would only order one sambal dish for the sake of having variety in the meal I am eating. We got the grilled hotplate sambal stingray ($16). Yes, their sambal is excellent: not very spicy, but it is aromatic. The sambal itself presents quite good value: thick and fleshy for $16. The whole fish and chips ($18) is also value-for-money! It’s huge, an entire fish. And to top it off, it’s super fresh, not fishy at all. The flesh is moist and white while the skin is extremely crispy. The batter is just a light touch, which is really great. I love this. They have been opened for some time already. But the system didn’t run smoothly. I saw the wait staff frustrated and unable to handle. Actually since this is mostly a self-service system, I don’t know why they couldn’t handle the crowd. In fact, after this meal, I craved for their fish and chips so I ordered online through a food delivery site. This is the first time ever that my order was rejected. Delivery is easy money to earn for the restaurant because it just has to prepare the food and the delivery person picks it up. Seems like no trouble at all. But D’Grill actually rejected my order. I think something wasn’t running smoothly there. Since this occured a few months ago, I hope that they have resolved the issue. I also want to emphasize that this has nothing to do with our customer experience, which is great. I just want to let the restaurant know how it can improve. It’s self-service, so you have to key in orders at a machine (which looks like a SAM machine). But the touch-screen machine is really terrible, looks old, and dirty, and dusty plastic peeling off the screen. Can’t really press. Furthermore, the items are all over different pages, so it was difficult for us to even look for the dishes we wanted. They need to look into how to make the menu easy at a glance for people. But we were more than content with the meal. The food here is delicious and comes in big portions. Good standards. Very satisfied. I think we paid about $18 for a pax including drinks, a beer, and 2 bowls of rice. Definitely returning for more. Hilton Niseko Village Review, Hokkaido: Naked in Nature! Wild Wild Wet!